Need more information about booking Home 7261327 ? 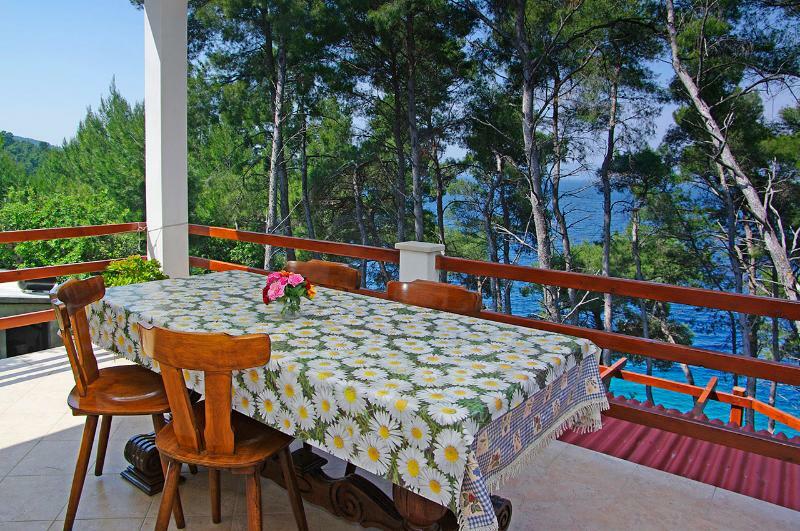 Relaxing and quiet house by the sea is secluded house situated between two little bays 6 km from Vela Luka, Island of Korcula. Less than 50 m from the sea, no neighbors, no traffic, no noise, just pine forest in front of the house to protect you from the wind coming from the sea and olive trees behind house, with lot of fig trees and other Mediterranean plants all around. House has 3 bedrooms, two with duble bads and one with two separated beds, bathroom with toilete and shower. The kitchen, dining and living room in one unite. Big covered terace with stunning sea view, garden with plenty of aromatic herbs, outside grill, private parking next to house. Power supply is SOLAR and it is limited not suitable for large energy consumers. Celluar or pc charger is acceptable. Rocky beach in front of the house and less than 100 m from the pebble beach for children and non swimers. The road to house is asfalted with 1 km macadamy road. It is an ideal accommodation for windsurfers, for the windy afternoons, is also right choice for those who likes walking or ciclyng becouse the house lies on cycling and walking path. If you decide to have peacefull and easy holliday, surrounded with a nature,if you want to stay a way from the rush, smog, trafic than it is a right choice for you so do not hesitate to contact us.....and hope to see you! You can get in touch with Nikolina (the owner) through the contact form on this page. Send Nikolina (the owner) an email through the contact form on this page. Alternatively, if there’s a phone number on this page, you can call them. How do I contact Nikolina (the owner)? If you’ve already booked, go to Manage your holiday booking to view Nikolina the owner's contact details or send them a message. Or send Nikolina (the owner) an enquiry through the Contact the owner/manager form if you’d like a quote or more info first. When you pay online through the Book your stay form, a booking request is sent to Nikolina (the owner). You’ll find out within 24 hours whether they’ve accepted - no money will leave your account before then. You can also request a quote from Nikolina (the owner) through the contact form. The owner will email you the total cost for your dates and a link to book and pay online. Use the Book your stay form to pay provisionally online. You can pay by credit/debit card or PayPal. Nikolina (the owner) will have 24 hours to accept the booking and no money will leave your account before then. Why can't I call Nikolina (the owner) before booking? You’ll need to contact Nikolina (the owner) to do this. Send them a message in Manage your holiday booking or through the contact form on this page. You can request to change the dates or number of people on your booking via the Manage your holiday booking page. To change your holiday dates use the Edit booking button. If you need to change the number of guests staying then send Nikolina (the owner) a message. If Nikolina (the owner) agrees, they’ll send you a revised quote outlining the changes. You can review and accept/decline this from the Manage your holiday booking page. You’ll have 48 hours to take action before the revised quote expires.